The VS8 is a two-way high performance multipurpose loudspeaker in a trapezoidal chassis for fixed installations and mobile use. The cabinet is equipped with a 1" HF driver (1.34" voice coil), which is mounted onto an integrated horn with a coverage of 90° x 60° (H x V). 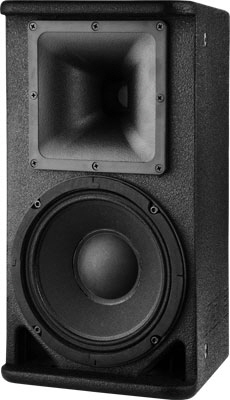 The MF/LF frequency range is covered by an 8" speaker. The integrated flying system includes 5 screws-nuts and enables the use of NE8 eyelets (M8) for installation. The integrated flange adapter (tube diameter 35 mm) enables the use of the VS8 on a speaker stand. 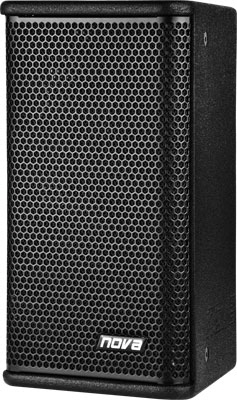 The flexbile VS8 suits for speech and music applications as a stand-alone fullrange system or MF/HF speaker in sound reinforcement systems. The chassis is constructed from 15 mm plywood (birch) and covered with black NOVA PolyCoat© finish. The cabinet is equipped with one grip handle and a front grill with transparent charcoal foam backing. Two speakon connectors (NL4) are mounted at the rear side of the chassis for signal input (input) and signal link (link). The power rating of the VS8 is 150 W (RMS), the impedance is 8 ohms.